We've been decorating today. I've been in a fetch and go mode. Since my decorating skills are limited, I relegated to the, "Go get the green box from the shed. Now, go get the box with the wreaths. Go get the lights." You get the idea. I ran to the hardware store for a pot for the tree and some glue to fix an antique stocking holder that was broken last year. To get out of the way, I headed to Sumiton (a small town about 11 miles away) to get Chinese food for supper. That much I can do. 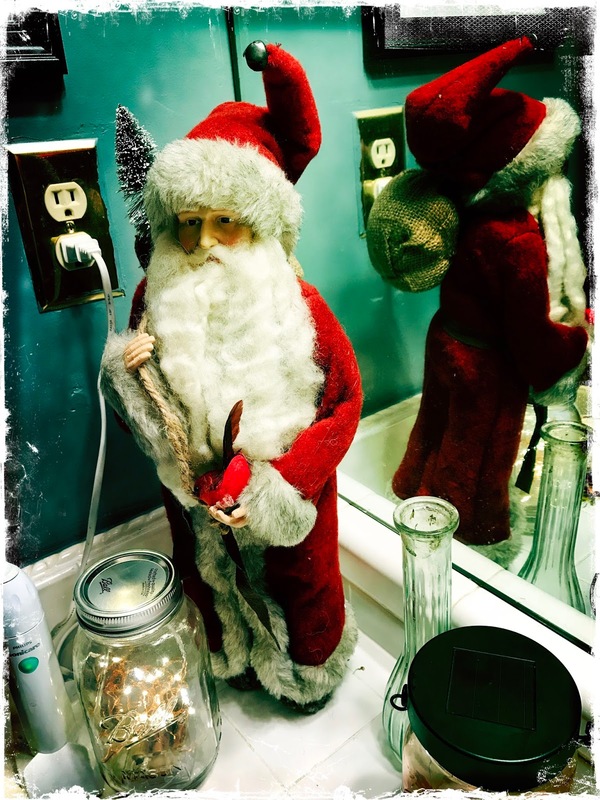 When I got home, I went into my bathroom to wash my hands for supper and there on my vanity was Santa. It was good seeing my old friend. Tomorrow, we'll put up the tree. Ahhhh, the Christmas Spirit. I love it. I like a few decorations around. But I will still have to wait a few more days, we still have a few hundreds of road trip before we will be stable enough to decorate... It will probably be the house this year instead of the motor Home! It is indeed beginning to look a lot like Christmas. Less so here, despite us being closer to the day. Colour me lazy. I love your Santa and I do believe that yes, even bathrooms must be decorated ! You helped make decorating much easier I'm sure ! Hope you have a very happy Sunday! That is a good looking Santa, I like him. Around here the inside decorations like you I do the fetch and carry type of stuff for Cindy, but the outside is all on me...I love this time of year. Good luck on landing that job. I know you'll do well. It sounds like you've definitely got the Christmas spirit.